I haven’t had this much fun being a monster since I don’t know how long! Many thanks to Steve, my brother-in-law, and his wonderful Christmas gift of an Xbox One S this year, my son and I have been engrossed in playing Plants vs Zombies, Garden Warfare 2 together. I love the Art Direction that this game received! It’s the best b-movie game, I would dare say, ever! One of my new favorite characters is Chomper. 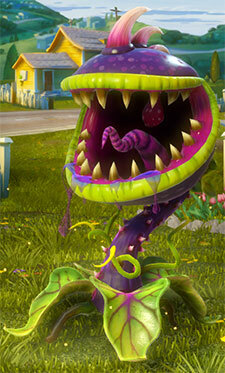 Much like in the original game, Chomper can eat zombies to instantly vanquish them, as he is a close combat fighter. This is a powerful ability, but as a drawback, most of the Chompers have no ranged attack, except Goop, which is meant to slow enemies. When the Chomper swallows a zombie, there is a short cooldown during which he can neither attack nor move as quickly as normally. Unlike in Plants vs. Zombies, he can burrow underground to catch zombies by surprise as well as spit goop to slow enemies and place Spikeweeds to snare enemies. Spit goop?! Now how can you go wrong with this golly fellow?